One major benefit of having a frameless bathroom mirror is you do not have to worry about matching it with a different type of interior. As the mirror is frameless it goes well with almost all kind of bathroom backgrounds. Plus they come in a variety of size and shape to match perfectly with your bathroom interior. From round, rectangular to custom frameless mirrors, you can make your bathroom look beautiful. And we’re here with our best frameless mirror reviews to brighten up your bathroom appearance. 11 How To Hang A Frameless Bathroom Mirror? Above table will give a basic insight about it, so let’s continue the mirror reviews and buy the best shape or design for your bathroom. Beveled edges of Howard Elliott oblong frameless scalloped mirror simply adds a touch of elegance. And as it is frameless you do not need to worry about mismatching background or interior styles. In addition, this 24×32 oblong shaped mirror comprises of 4 D-rings at the back. All the rings are secured tightly on the back so you can easily fix the mirror onto the wall. Location of these d-rings is such that, you can fix it in oblong shape or convert it into a rectangular frameless mirror. Either way, it is gonna look beautiful. Even though D-rings are strong enough to hold a large frameless mirror, you should follow proper installation steps. Never hang it using picture wire or chain. Doing so will dangle the surface and increase the chances of it falling down due to unbalanced weight distribution. So it is best to hang the unit by the 2 strap hangers directly into D-rings affixed on back. The seamless design of the surface is perfect for hallways, living room and bedroom apart from the bathroom. Tight on a budget? But want to buy an elegant mirror for your bathroom? Then here we have a budget-friendly, cheap frameless bathroom mirror by the Better Bevel. Round in shape with 24 inches of diameter, this unit is ideal to place in vanity bathrooms, powder room, etc. 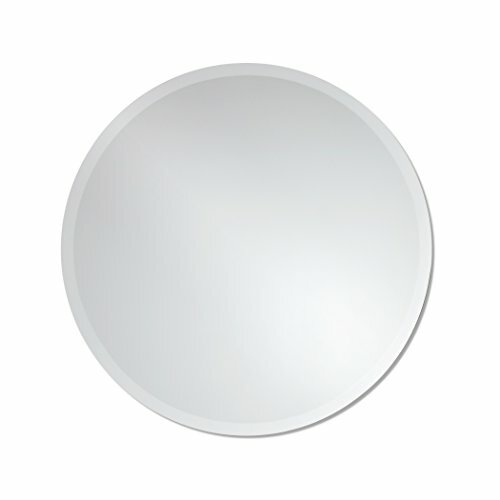 Size of this round frameless mirror is large enough to let you complete your task properly. Therefore, you do not have to move around too much too shave your beard or to apply makeup correctly. While 1-inch of beveled edge looks beautiful, its 1/4-inch clear mirror provides a distortion-free reflection. As a result, you can perform all your bathroom activities precisely. Moreover, it includes 2 pre-install loop size hangers on the back. And to make wall mounting frameless mirror easier, the company provides drywall anchors and screws. Just find appropriate hardware to install the bathroom mirror properly onto the wall. Water spots on edges are ugly. And sometimes, these spots do not disappear easily even after cleaning the surface number of times. So if you’re going to install a mirror above a sink or near water outlet then make sure the surface is spot resistant. 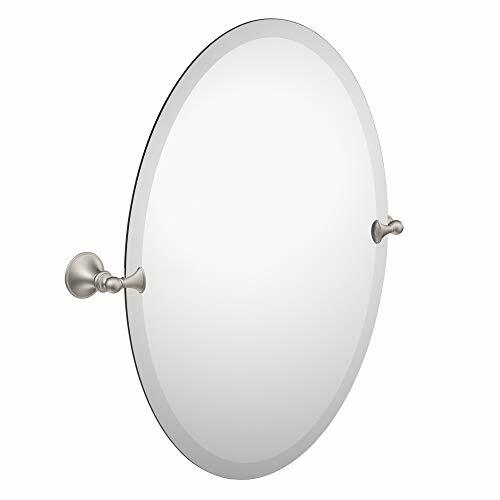 And this product from Moen is the best oval frameless bathroom mirror having spot resistant finish. Such type of finish helps in cleaning of ugly water spots on edges easily. So you can hassle free place it over a bathroom sink or similar areas. Another fantastic feature of Moen DN2692BN is, it is a tilting mirror. This tilting feature lets you adjust the unit to a convenient angle. Don’t let titling feature confuse you with its set up as it is easy to perform the installation. In fact, it comes with all mounting hardware and a template to mount the unit on the wall easily. This template eliminates guesswork by providing you with accurate markings. Performing bathroom activities such as shaving the beard, applying make-up, or scrubbing face gets a bit difficult if your face does not fit perfectly in the frame. And nothing can be better than having a frameless tilting mirror to overcome such problems. 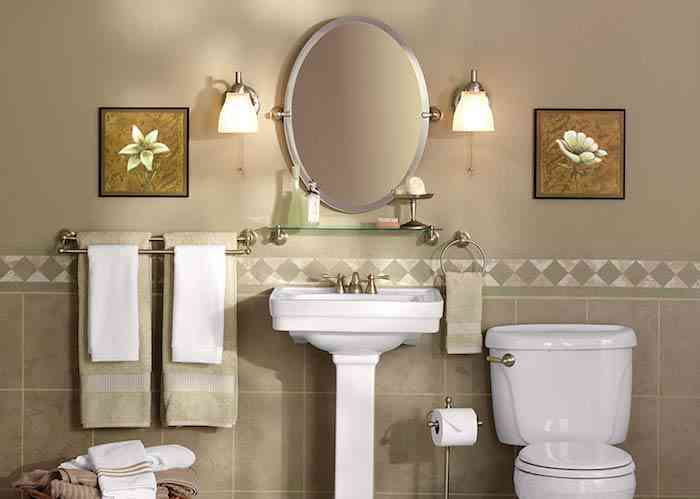 The Moen oval bathroom mirror is not only elegant but highly durable. Credit goes to use of premium materials in its construction. In fact, the brushed nickel finish will not rust out easily despite placing it over the bathroom sink. Furthermore, this brushed nickel finish is spot resistant. The benefit of having a spot resistant finish is you do not have to worry about ugly water spots. Hence, you can tilt the surface of the oval mirror with moist hands without worrying about fingerprint marks. And in case if you observe any mark or spots it is very easy to clean nickel surface using a clean, damp cotton cloth. Besides that, Moen includes all necessary pivoting hardware and template to ease the installation process. One common choice of people while seeking the best bathroom mirror is the one with a rectangular shape. And why not as rectangle mirror are long and wide enough to let you perform bathroom activities smoothly. However, it is not really necessary to buy a large frameless bathroom mirror as it will simply take up space. Also, you will have to invest more time cleaning it. In our opinion, large mirrors go well in powder rooms, hallways or bedroom as they get less dirty. But it is no harm in placing a large mirror on the bathroom if you’ve got abundance space. But here we have a 20×30 inch small unit that is just perfect to see yourself while brushing teeth, applying makeup or flossing. And the 1-inch beveled edges simply adds a touch of elegance and modernness. Therefore, it is the best large frameless mirror for people who do not wish to buy a framed model. In addition, you have the freedom to hang this rectangular unit either horizontally or vertically. Give your bathroom a touch of elegance with this Emma shaped frameless beveled mirror. This high-quality unit has a crystal clear surface on one side whereas solid core wood backing enhances safety and stability. This sturdy wood backing comprises of 3 hole hooks, one on top and other rest are on one side. Placing of the hooks is such that you can hang the unit according to space available. In short, you have the freedom to hang it vertically or horizontally. And trust us, no matter how you hang it, your place will just look beautiful. 2.5-inch thick glass of silver nature eliminates reflection distortion. Such distortions are common in low-end glasses. But you do have to worry about the composition of this product as it is one of the best beveled mirrors in terms of quality. In fact, the company offers 100% satisfaction guarantee. In case you’re not happy with their product then you can simply ask for a full refund. Thus, elegant design and user-friendly features make it worth your money. Here comes another Moen product on our best frameless bathroom mirror reviews. Now, this unit is really best for people who love the old, dark finish. Not only does this elegance mirror impresses by its looks but it has a tilting feature. So it is a combination of both, old style finish and modern design. Thus, perfect for modern bathrooms. The oil rubbed bronze gives antique look as well as is resistant corrosion. This, in turn, ensures excellent performance for years. 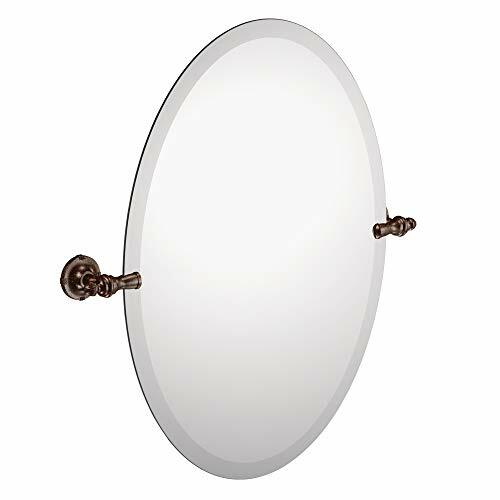 Moen oval tilting mirror comes with mounting hardware and a convenient template. Therefore, you can finish installation in a short amount of time by the following instruction properly. Plus it includes a metal mounting post for added security to tilting feature. Apart from that, pivoting hardware lets you position your oval beveled mirror at an angle best for you. 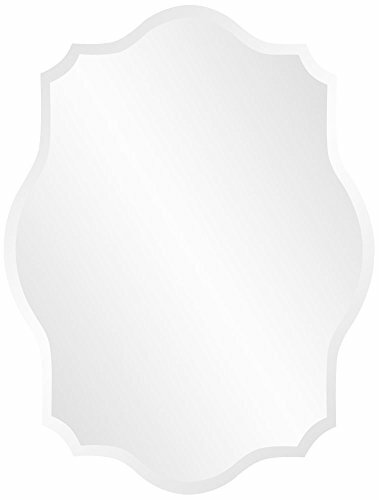 So yes, it is a beautiful, antique looking and durable bathroom mirror with a modern touch. The unique design of this frameless beveled mirror is just perfect for modern bathrooms. Design of the unit is such that it looks highly expensive even though it is not that costly. But that cheap price does not affect the quality of the product. This 30 x 30 frameless bathroom mirror is constructed of authentic 1/4-inch thick glass. Good thickness and material quality eliminate reflection distortion. Thus, you get a crystal clear image to properly carry out bathroom activities. Wood core backing is sturdy, safe and durable as compared to other backing materials. Such strong backing ensures the unframed mirror remains stable. In addition, it comprises of 2 reinforced D-ring hangers onto the backing to hang the unit properly. Plus all necessary equipment such as screws and drywall anchors comes along for easy installation. 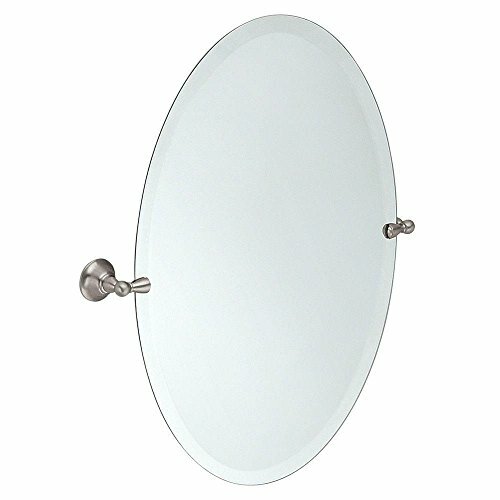 But above all, the unique round shape of glass with scalloped edges is ideal to hang on hallways and living room beside the bathroom. 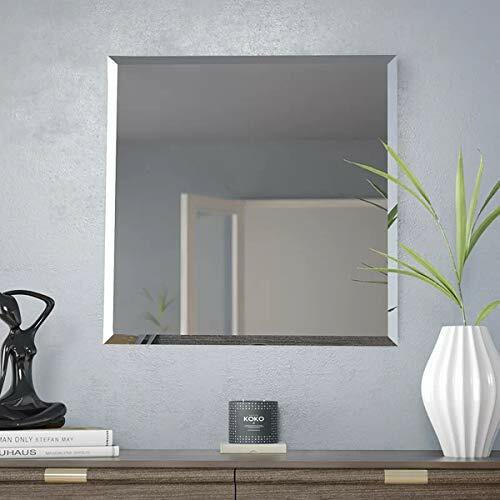 Last on the review list we have Kohros square frameless wall mirror. Square shape easily mixes with almost all types of background. Plus it looks beautiful because of the simple design and 0.59-inch beveled edge. While 3/16 inch thickness is the reason behind the high durability of the product. And protective coating on surface prevents tarnishing and corrosion. 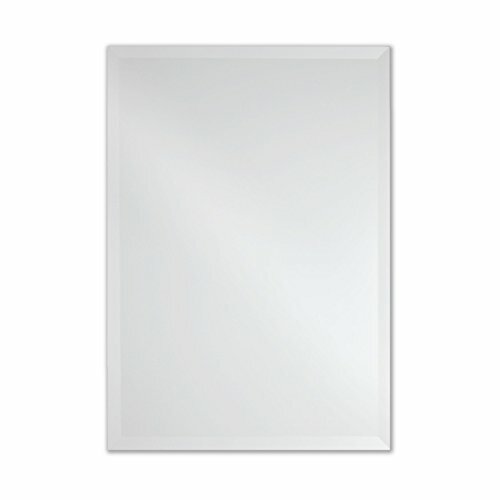 Therefore, you can hassle free place this square beveled mirror above a sink or any other water outlets. Similar to many other units on our best bathroom mirror reviews, this model also comes with installation hardware. And on backing side, it includes 3 clips and 2 screws to hang the glass horizontally or vertically. But no matter how you install the unit as the square is equal from all sides. However, Kohros does come in other shapes and sizes in case you want a different look. 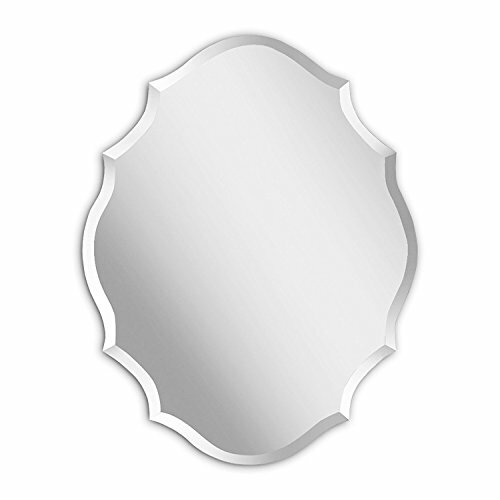 Be it a bathroom, powder room, or bedroom, this elegance mirror will add a touch of charm wherever you hang it. How To Hang A Frameless Bathroom Mirror? I personally think that you should take professional help to mount your mirrors. However, if you have all the tools in your home then you can successfully hand it all by your self. How to avoid any fall, we personally advise using the bolts which you can either buy from any hardware store or may come along with your mirror set(1). To get a clear idea about the process you can check the instructional video here. When buying a bathroom mirror, always make sure to pick the right size. First of all, decide the location in your bathroom where you want to hand mirror. Also, keep its usability into consideration. For example, are you looking for a bathroom mirror for shaving, or for applying makeup? Accordingly, pick the right size and most people like to hand it above the sink or use it as a vanity mirror to get ready. Also, don’t forget to pick the shape of the mirror. 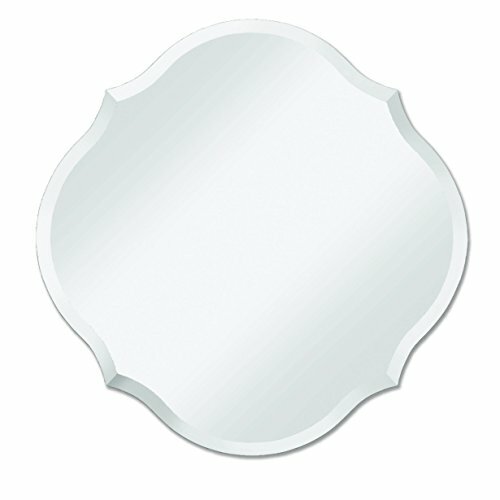 In our list, you can find an oval, rectangle, curved, or unique pattern mirror shapes to choose from. Pick the one which suits your home mood or flavor. In any case, these bathroom mirrors are excellent in quality and when taken care, it will last longer without losing its reflection capability or shine.